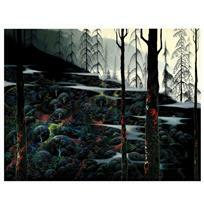 Eyvind Earle (1916-2000), "Fog Draped Hills" Limited Edition Serigraph on Paper; Numbered & Hand Signed; with Certificate of Authenticity. $2,200.00 $1,200.00 Only 9 Left! 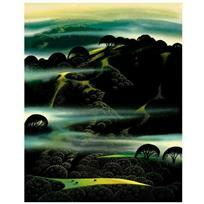 "Fog Draped Hills" is a limited edition serigraph on paper by Eyvind Earle (1916-2000). The piece is numbered, hand-signed by the artist, and accompanied by a certificate of authenticity. 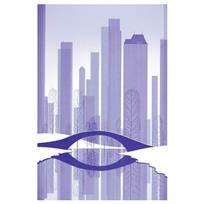 Measures approximately 20" x 16" (image). 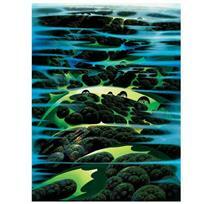 Born in New York in 1916, Eyvind Earle was always a prolific artist and an intellectual. When Earle was 10 years old, his father challenged him to either read 50 pages of a book, or, paint a picture each and every day – Earle decided to do both. His skills, especially as an artist, grew quickly and by the time he was 14 years old he had his first one-man exhibition in France. At 21, the enterprising young artist bicycled his way from Hollywood to New York, painting 42 watercolors along the way to help finance his trip. Earle spent a great deal of time traveling, exhibiting his work, and trying to find ways to make money during America's great Depression. In his twenties, he came up with an idea to make Christmas cards - at first cutting his designs out of linoleum and printing them - eventually turning his Christmas card making into a lifelong tradition. By 1939, one of Earle's paintings was purchased by New York's Metropolitan Museum of Art for their permanent collection. In 1951, he was hired by Walt Disney Studios as a background painter for many popular and some award-winning animated films, such as "Toot, Whistle, Plunk and Boom" (winner of the 1954 Academy Award for Animated Short Film), "Peter Pan" and "Lady and the Tramp". Earle was the man behind the styling, background, and colors for “Sleeping Beauty,” with its magical, medieval style that in many ways was a departure from Disney's earlier stylings. After 15 years in the animation business, Earle returned to painting full-time, and spent the rest of his life doing that. Over the next few decades, he had countless solo exhibitions across the United States and abroad, including ones in London, Japan and France. 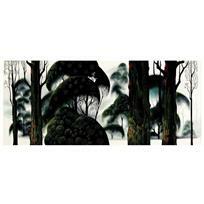 In 1991, his illustrated autobiography Horizon Bound on a Bicycle was published, as was his book, The Complete Graphics of Eyvind Earle and Selected Poems and Writings, 1940-1990. After countless shows exhibiting his work and honoring his lifetime of achievements both in animation and in painting, Eyvind Earle passed away on July 20, 2000. Eyvind Earle (1916-2000), "Cattle Country" Limited Edition Serigraph on Paper; Numbered & Hand Signed; with Certificate of Authenticity. 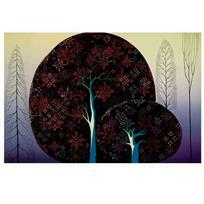 Eyvind Earle (1916-2000), "A Tree Poem" Limited Edition Serigraph on Paper; Numbered & Hand Signed; with Certificate of Authenticity. Eyvind Earle (1916-2000), "Beauty Beyond Believing" Limited Edition Serigraph on Paper; Numbered & Hand Signed; with Certificate of Authenticity. Eyvind Earle (1916-2000), "Central Park" Limited Edition Serigraph on Paper; Numbered & Hand Signed; with Certificate of Authenticity. Eyvind Earle (1916-2000), "Dawns First Light" Limited Edition Serigraph on Paper; Numbered & Hand Signed; with Certificate of Authenticity. Eyvind Earle (1916-2000), "Early Morning Fog" Limited Edition Serigraph on Paper; Numbered & Hand Signed; with Certificate of Authenticity. 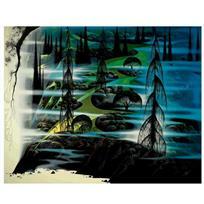 Eyvind Earle (1916-2000), "Forest Magic" Limited Edition Serigraph on Paper; Numbered & Hand Signed; with Certificate of Authenticity.